Deerbrook Freehold Condos for sale. Deerbrook Freehold is a condominium community in Freehold Township, Monmouth County, NJ. Located at the southern end of Freehold Township, it offers easy access to transportation, as well as the exciting downtown of Freehold. In 1982, 72 homes were built. There are nine buildings and each has 8 condos in it. Therefore each building has 4 upper units and 4 lower units. And all are end units with 1197 sq ft*. Every condo has the same open floor plan, with 2 bedrooms and 1.5 baths. 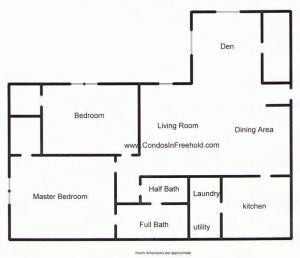 Deerbrook’s condos have large walk-in closets, a kitchen, utility/laundry room, living room/dining room, and also a sunroom. Regarding the sunroom, it has a large storage closet as well, and in some units a wall has been added for privacy, or to create a third bedroom or den. The monthly fee includes common area maintenance, lawn care and snow removal, in addition to garbage removal. Your pets are welcome in this community. Deerbrook Freehold is not approved for FHA financing, however, there are mortgage programs available to qualified buyers that allow for a similar low down payment. School age children in grades kindergarten through eight living in Deerbrook Freehold will attend the Freehold Township school system. There are six schools in the district. When students enter High school those students will attend the Freehold Regional High School District. Each of the six schools in the Freehold Regional High School District offers a specialized studies, such as medical and legal prep, performing arts among others. Admission to these courses is competitive. High school students may also attend the Monmouth County Vocational School District. Specialized courses are available in fields such as computer science, and biotechnology. Also courses in the medical and science fields are available, among others. Also offered are courses in the automotive field, the building trades and medical and dental fields. Commuters love Deerbrook because it’s within walking distance to the buses on Route 9.